Add elegance and utility to your home with custom home theater cabinets and furniture from Theater Cabinets, Inc., of Orlando, Florida. As our name suggests, home theater design is our specialty! 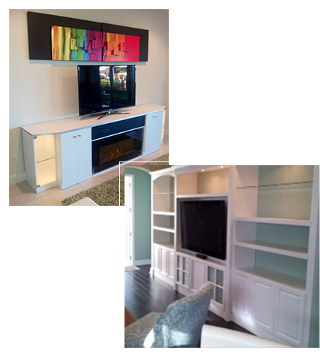 We offer custom, one-of-a-kind home theater cabinets built from all-wood material, not prefabricated boxes. Function is our utmost priority. We create cabinets of all styles, colors, and sizes to meet your specific needs. For your convenience, we offer A/V equipment and hook up through our many A/V company affiliates. If you have a large project in mind, such as creating a complete audio-visual room for movie viewing, gaming, and more, then our strict attention to detail, precision quality, and many years of woodworking experience will definitely come in handy. We customize your space with home theater cabinets of all sizes, shelving, and other unique pieces to make your vision come to life. When you are undergoing a major project, such as home theater installation, it is important not only to achieve the desired look, but also to trust that the units are of top quality. These cabinets are often home to thousands of dollars in equipment. Be sure that they are well-constructed and offer easy access to wiring and moving. We use only the highest quality of solid wood and laminate products for each custom piece we build. Call us today to speak with one of our specialists about creating the right design for your project for beauty and function. Theater Cabinets, Inc., is proud to be the ultimate home theater cabinetry supplier serving central and southern Florida, with product and installation of the highest standards. We ship our custom cabinetry and furniture throughout the United States. Contact us at (407) 694-1118 in Orlando, Florida, for functional and attractive home theaters.